Threading hair is an ancient method that is commonly practiced in Eastern countries such as India and Egypt but is now very popular in Western countries, too. Removing the entire follicle of the area threaded such techniques typically last between 4 to 6 weeks and involves absolutely no chemicals and so is great for people with sensitive skin. Why choose Threading as a hair removal technique? If you are tired of clumsily plucking with tweezers the alternative is threading, so treat yourself to beautifully shaped eyebrows today. Threading is a natural way of removing unwanted eyebrows or other unwanted facial hair. This type of hair removal is less painful and suitable for more sensitive skin. 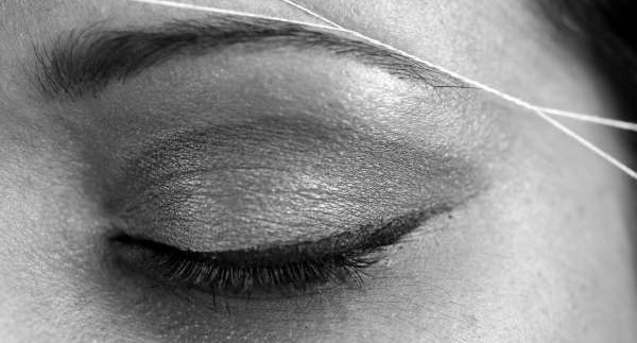 Although many areas of the body can be threaded, one of the main advantages of threading is the fact it allows full control when shaping eyebrows to ensure perfectly sculpted brows. It is also a very quick so ideal for people on the go and it the temporary results can in fact turn into permanent due to the fact frequent threading can cause hair follicles to be damaged, and over time, stop the hair from growing. Suitable for both women and men, threading lifts the area around the eyes and brightens the face for all. Threading is an extremely fast and simple method of removing unwanted hair. The procedure utilises a length of thread which is twisted back and forth along the hairs which are to be removed. The twisting action of the thread traps the hair and lifts it out of the follicle. This method of hair removal is more effective and far less painful than tweezing. Hair re-growth becomes finer and sparser after regular treatments and over time, can cause permanent hair reduction. With this unique method, hair is removed by the roots, in manner similar to waxing. In regards to eyebrows, the results of threading are wonderfully neat and perfectly symmetrical eyebrows which can knock years off of you.